One of our most popular rustic wedding party favors! Quaint and charming is our "Rustic Romance" Wood Heart Place Card Holder & Photo Frame! Add a little softness to your wedding day while marrying the old with the new. Our nature inspired faux wood frame measures approximately 3" square and is complemented nicely with a heart shaped space for a 2 1/8" x 2 1/8" photo. Our divine frame is a square resin frame with faux wood print, black back and convenient frame stand. Whether you use it for a place card holder or a photo frame, it will certainly be a captivating wedding accessory. Place cards are included. 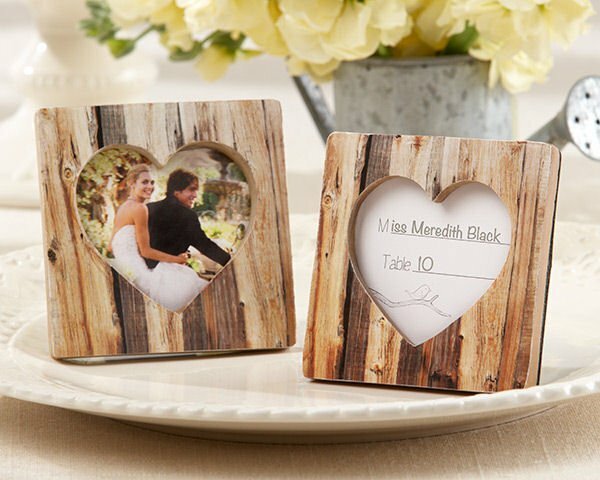 What is the size of your 'Rustic Romance' Wood Heart Place Card Holder & Photo Frame? The The Rustic Romance' Wood Heart Place Card Holder & Photo Frame measures approximately 3" square and the heart shaped space for a 2 1/8" x 2 1/8" photo. Unfortunately the Rustic Romance' Wood Heart Place Card Holder & Photo Frame does not include a place card and personalization is not available for this item. Hello, For the rustic romance wood heart place card holder and photo frame. Does that have a back where it can stand up? This Rustic Romance' Wood Heart Place Card Holder & Photo Frame has a convenient frame stand at the back. Does the frame have a glass front?